In our practice, Dr. Steven Reto, Dr. Harry Halscheid and Dr. Kerri Bakker perform comprehensive eye examinations at both the West Chester and Exton office locations. Our doctors examine patients of all ages, from infants to seniors. All examinations include visual assessments and ocular health evaluations, including glaucoma testing and pupil dilation. The American Optometric Association urges parents to include a trip to the optometrist in the list of well-baby check-ups. A baby’s eyes are her windows to the world. Assessments between six and twelve months of age can determine healthy eyes and visual development. Our doctors encourage parents to have their children examined during the first year of life. Upon reaching school-age, it becomes very important that all children undergo annual comprehensive eye exams. While school screenings may determine that a child sees “20/20” or has “good vision”, this does not encompass all aspects of healthy sight. Many children suffer with vision-related learning disorders based on a deficiency in visual motor or visual processing skills. In cases such as these, a comprehensive eye examination may be the first step towards successful academic development. As we advance into adulthood, the risks for ocular disease increase significantly. 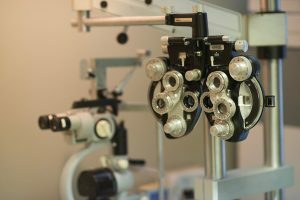 While it’s easy for an asymptomatic patient to neglect the annual eye exam, this annual check-up remains very important to the health of our eyes. A comprehensive eye examination with pupil dilation allows doctors to evaluate patients for signs of glaucoma and macular degeneration, as well as systemic health issues such as hypertension, diabetes and multiple sclerosis. When early signs of ocular disease present, our offices offer the most current equipment used in the detection and treatment of such concerns. We provide on-site specialists when care must extend beyond the comprehensive examination and into medical or surgical treatment. From early childhood and throughout life, the annual comprehensive eye exam is a priority.